I always try to make my life more interesting so that every day brings something new. Having a broad range of hobbies is important to me to make sure I never get bored. Of course, when you're a mother, you don't have a lot of time to get bored! One of the things I enjoy doing is growing fruit and vegetables. You can do it in your garden or your kitchen, and some people are even lucky enough to have an allotment. There are lots of great reasons to grow food at home. I love it and here's why I think you should too. My little girl is growing up, and I know it won't be long before she wants to be more independent. Since I can't keep her to myself forever, I try to do as much as I can with her now. She already would often much rather be with her friends! Gardening is an amazing thing to do with your kids. It's fun for them to join in with the digging, watering and other tasks. You can spend time with them and bond over a shared activity. And it helps them to learn about the work that goes into making their food. A lot of kids don't have the first clue where their food is from or how it's grown. It's not just children who don't know how their food gets to their plate. You might make an effort to find out, but it isn't always possible to know everything. Growing my own food allows me to know exactly what has happened to my food because I did it! I plant everything and choose what fertilisers and other things to give it. I know how I protected my stuff from slugs and bugs, and I know how long everything took to grow. Then when I cook with it or preserve it, I know how that's done too. My favourite thing about growing fruit and veg is that it's easy - even kids can do it! As long as you choose the right things to grow, you can have success. You have to learn a little about how to do things properly, but anyone can pick it up. You can plant fruit trees, tomato vines, potatoes, squash, and lots more. Some of the easiest things to start with include lettuce, peas and beans. My favourite thing about growing fruit and vegetables is that it's good for you. Not only does it help you eat more healthily, but it's good for your mental health too. It gets you outside and gives you time to relax and have a think. It provides you with a purpose too and when you get to harvest everything, it gives you a great sense of achievement. I love the feeling I get from maintaining my garden - and eating the results! If you've never tried growing your own fruit and veg, I recommend giving it a go. It could change your life or at least your eating habits. 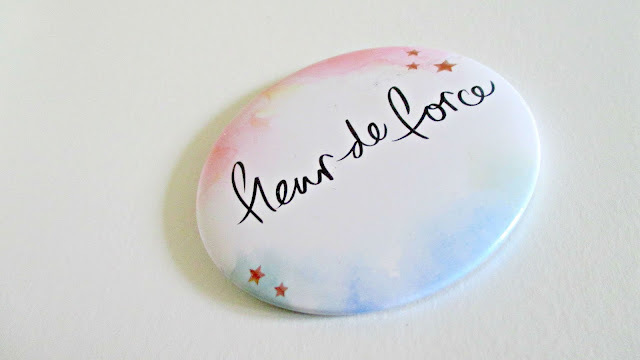 Fleur is one of only two Youtuber's that i follow. One trait i really hate in people is the power trip. We've all been guilty of it to some degree but there are some people on Youtube that have let the fame go to their heads and have forgotten who they were before, but Fleur isn't like that and that is why i love her so much. So when she announced that she had created a beauty range along with the eyelashes, i got excited and knew i had to loosen the purse strings. Cosmetic bag £8.99 - I was surprised when i pulled it from the box. On her video and on the website, it's size is very deceptive but this really isn't a bad thing. I've needed a new make up bag for so long now as my £3 Primark old familiar is on it's last legs so this was the first thing i put in my basket. 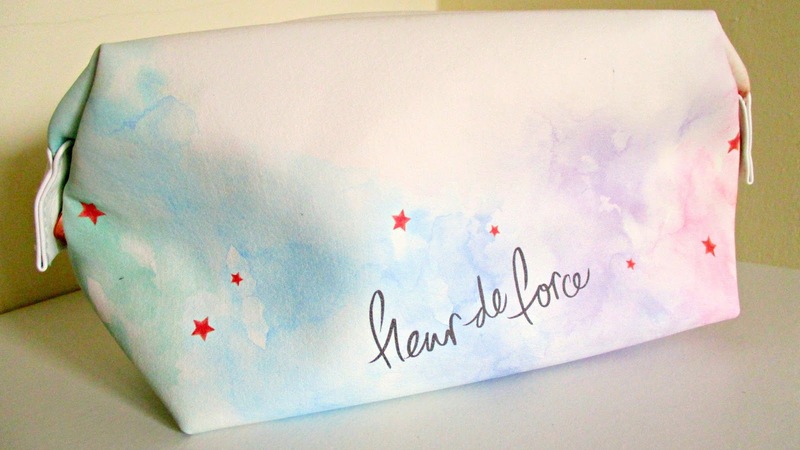 The design is alike to the cover of her book The Glam Guide with the water colour affect, stars and her signature Fleur De Force branding. It also has rose gold hardware and can be unfastened at the sides to increase storage space. The bag is ideal for carrying around my make up and any brushes that i need and it feels quite durable so hopefully it will withstand the test of time. 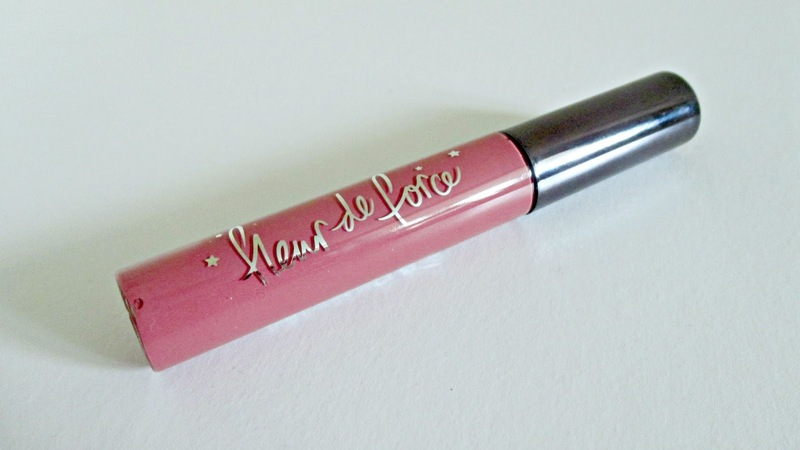 Lip Gloss - Written in the stars £6.99 - I've never been a huge fan of lipgloss because i find the feeling of it on my lips quite unpleasant and i hate the sticky feeling they leave behind after it's been applied. But this one really appealed to me after Fleur talked about it. She said that it doesn't have the sticky feeling and the colour lasts aswell. So i opted for "Written in the stars" which is a your lips but better shade and i absolutely love it. When i pulled the wand out of the tube, the first thing i noticed was the smell. It has a lovely vanilla scent which reminds of the filling inside a walnut whip, a nice added touch. 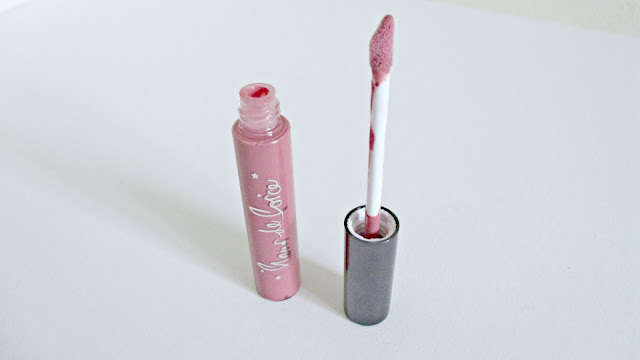 On application, it did have that slight sticky consistency which was to be expected, however, after a few minutes i completely forgot i was wearing it and the colour lasted through all my usual lip make up tests (drinking from a glass and kissing my boyfriend). This lipgloss has completely changed my perspective on lipgloss in general. 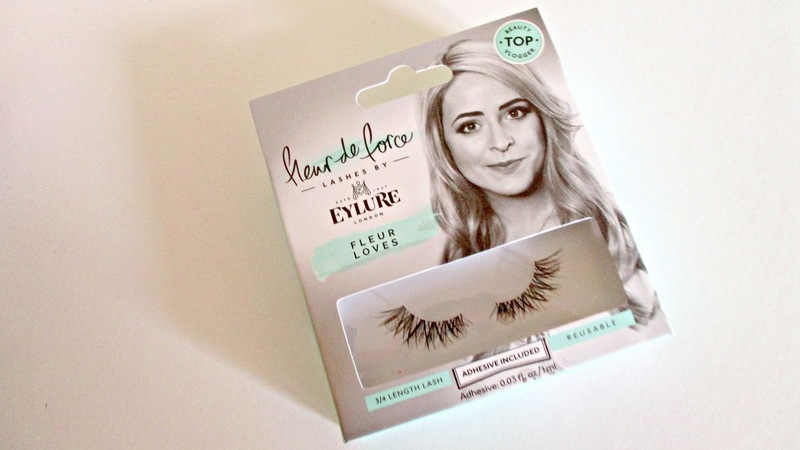 Eyelure Eyelashes - Fleur Loves £5.25 - These little beauties are what i was most excited about. 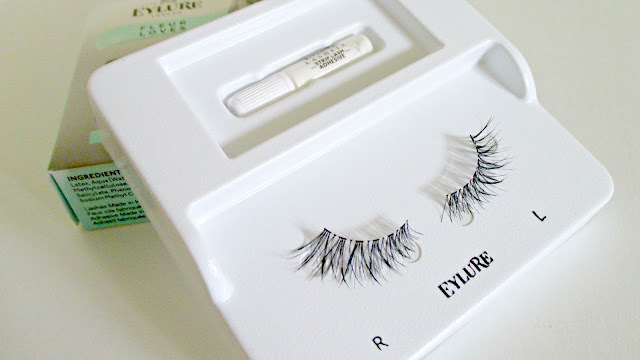 I've been using Eyelure lashes for longer than i care to remember and when it was announced Fleur was bringing out her own range, i went a little bit giddy. You have no idea how hard it was to pick just one pair as i love them all but in the end, i opted for the Fleur Loves. 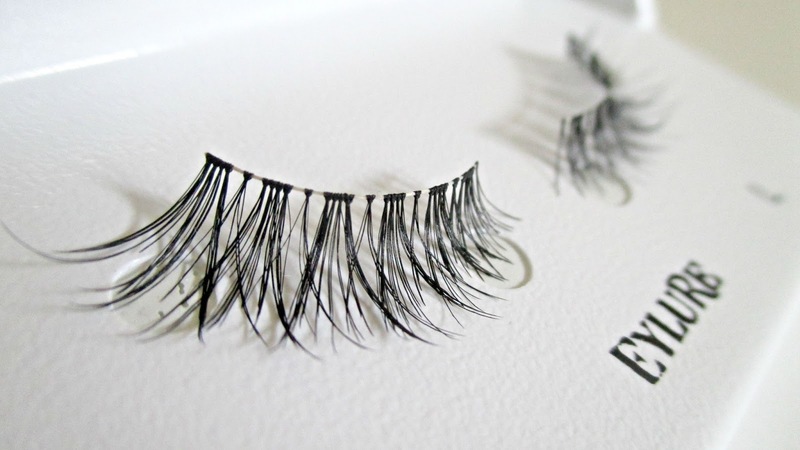 To me, they are like natural lashes but with an extra kick. I'm saving these for a friends wedding in October but i know that they will look amazing and seeing as i am an expert with Eyelure lashes, i know they will last the whole day and will be excellent quality. Compact Mirror £4.99 - This was included in my order as a free gift when you buy 2 or more products from the range which was a nice surprise. I have a small mirror that i keep in my make up bag that has somehow lasted me 10 years but it is really showing it's age and needed replacing so receiving this couldn't of come at a better time. It's the perfect size to carry around in your make up or hand bag and is printed with the Fleur De Force branding. Overall, i'm really happy with the products. At some point, i will buy one of the eyeshadow quads but for now i'm more than happy. Well done Fleur, i can't wait to see what you have lined up next! If you like the look of Fleur's beauty range, head on over to Feel Unique and treat yourself. I was lucky enough to be invited along to the launch night of a new and exciting business called 'At A Social Event'. The concept behind this, is to involve social media in your wedding day by projecting all the photos, tweets, instagram snaps etc onto a screen for everyone to enjoy. Aswell as social media, they also blog your wedding aswell! The brains behind the idea is the lovely Sarah who we got to meet and have a chat with. I went along to the event with my close friend Ashton who is also a blogger and a very good one so please go check her out! Even though i'm not engaged yet, i have got big ideas for my wedding and having something to do with social media is always going to be on the list, so i am definitely going to be sending an e-mail over to Sarah when it comes to organising my big day and get one of these set up. The event itself was held at the Forever Bridal Boutique at Willerby Manor and it is run by the lovely Rachel who we also had a really good chat with. The boutique is beautiful and has a selection of wedding gowns and bridesmaids dresses that immediately caught mine and Ashton's eye. I fell in love with one dress in particular. Unfortunately, i could only pull it out a little bit to capture the detail on the bust but i wish it was on one of the mannequins because it's absolutely beautiful and exactly the type of dress that i want when my big day does finally happen. Through the night, we enjoyed bubbly and cute canapés. Me and Ashton had such a laugh while talking about her recent holiday and hoping that our men will propose to us in the not too distant future. We also got chatting to a local wedding photographer called Jemma who took a real interest in blogging and told her all about using #HullBloggers. Between me and Ashton, we convinced her to start using Twitter haha. It was a really nice night and it was great to experience At A Social Event and learn about how it works. It was also really nice (if not dangerous) to have a look at wedding dresses, something i really hope to be doing for real one day. A massive thankyou to Sarah for inviting me and to Rachel for letting us use your beautiful shop. I had a great night. My daughter is the best thing that ever happened to me because there is nothing like becoming a parent. I know all parents say that, so it has become a bit of a cliché. But, it is a cliché for a reason! Still, there are times when we don’t always see eye to eye. Recently, I have been trying my hardest to keep her as happy as possible without being a pushover. After all, isn’t that my job? So, I have come up with a few things that I would like to share. Hopefully, it might help other parents out there and soon to be parents! What I have come to realise is that we start to clash when we are in the house for an extended period. There is only so much for her to do in the house, and not enough room for the two of us! So, I like to get us out of the house as much as possible. Obviously, when kids are at school, it is not a problem. But, during the holidays it becomes more important to have days out with kids, so they don’t get bored. A simple trip to the shops is enough to break the day up and a good way to spend quality time with one another. Again, I don’t want to spoil my little girl. The problem is when you become a parent you cannot help give them what they want. Over time, you start to tone it down for the good of their upbringing, but it doesn’t mean you can’t still treat them from time to time. A surprise gift or present is the best way to keep them happy. The best thing is it can be anything from the latest video game to a new bike or even a packet of sweets. I try and reward my little girl when she has done something positive, and she deserves a treat. I love cooking with my daughter because it is a great way to bond and spend time together. More importantly, it teaches her a lot about life. For one thing, she will be a fine cook when she gets older, so there will be no TV dinners for her at University! And, another benefit is that it fine tunes her metal mathematic skills, as well as her ability to follow instructions. Plus, preparing a full meal can take anywhere from forty minutes to a couple of hours. What I love about this method is that it encourages my daughter to make the most from very little. Kids have great imaginations, so they should be encouraged to use them whenever possible. By making up games, you can stretch it out for as long as possible. And, they can use their creative thinking to come up with rules and regulations that they find funny and enjoyable. When it comes to keeping your little ones occupied, it can be the hardest job in the world. However, I have found that by being proactive I can keep my daughter fully engaged and focused. Unless you are a freelance writer or a Youtuber, getting a job working from home isn't as simple as looking in your local paper and applying. I've had alot of people asking for advice so here are my best tips for getting a work from home job. 99% of jobs are scams - This may seem really harsh, but it's essential you know about it. If you go onto Google and type in "Work from home Jobs" you will be swamped by the sheer volume of people claiming to earn £5000 a month clicking website links or doing surveys. IGNORE THEM! These claims are masterminded by scam artists who expect you to pay money upfront in order to get this huge return. Don't fall for them!! Some companies expect a financial outlay - This one can be tricky. Technically, getting a job should never cost you, however, in some cases you do have to pay an initial outlay for supplies or starter kits. Ann Summers, Body Shop & Avon are some of the more well known companies that expect you to put your hand in your pocket before you can start earning. If it sounds too good to be true, it really is - This should speak for itself. If you find a job you like the look of and it sounds like all your Christmas' have come at once, then walk away. Always trust your gut feeling. An easy job isn't a well paid job - There are hundreds of work from home jobs out there that expect you to stuff envelopes. This might sound like the easiest job in the world but it's infact the worst. I have read story after story about this and the majority of businesses that tell you to do this pay you pittance and nothing near the NMW. Always use reputable job sites - Any decent company wants to advertise their job vacancies well and they will pay for the opportunity. To place a job vacancy on a job site, they have to pay a fee. If you see a vacancy on a job site that is titled work from home, you can guarantee it is genuine. Choose your employment status wisely - By this, i mean you must enquire as to wether the vacancy is employed or self employed. What i've discovered over the years of job searching, is that the vast majority of work from home jobs are self employed because it's easier for the employee to do their own tax and National Isurance than to send it to the companies head office. In this job that i do, i had the choice of employed or self employed so i was quite fortunate but do pay extra care to this. If you choose self employed, you may be paid more per hour but you will also have the arduous task of doing tax returns every year.
" My family have always meant more to me than a 9-5 job. If i can work in the same building as my family and know that they are only a few feet away from me, i know i can work harder and better than in a cramped office in the middle of a busy city centre. Plus i like my bed too much"
She laughed so hard at this and told me that she had exactly the same reason and she respected me for being so honest with her. They know why you want to work from home, everyone has the same reason. So if you think working from home is your cup of tea then i hope my advice will help you on your way. Working From Home - Is it all it's cracked up to be? I've wanted to work from home ever since Sarah was born. I knew that i never wanted to miss any of her milestones and being around her as much as possible was always going to be more important than working 9-5. I have also had an ongoing issue with authority and by that, i mean i don't like having some power tripping top brass mooching over me and watching my every move. But now after 12 years of searching and being in jobs i have absolutely hated, i am now finally working from home! So, is it all it's cracked up to be? I'm always around my family - One thing i found really annoying about working was that i missed out on valuable family time as the majority of my jobs meant i worked weekends or evenings. But now i am in the same house as my family when they come back from school and work and i can see them all the time. I will never be late - I've always been a stickler for time keeping and always made sure i got to work with plenty of time to spare but now i work from home, i literally roll out of bed, have a few hours to enjoy a coffee and Jeremy Kyle, grab my laptop and crack on! I can work wherever i want - If i want to work in the den, i can. If i want to work in the garden, i can. While i type this, i'm currently in bed with Netflix on whilst listening to calls. I'm not restricted to a stuffy office day in day out, i can work in an environment that suits me and i love it. I can have my phone on me all the time - One thing i absolutely hate is managers and supervisors saying you can't have your phone on you. In a way i do understand why that is, they want you to not be distracted while you work. But as a parent, i believe that anyone with children should be allowed their phone with them at all times incase (god forbid) there is a problem. Working from home means i never have to worry about being caught with it. I work alone - Don't get me wrong, i have worked with some fantastic people over the years and some have become firm friends but i love the fact i am now working on my own and don't have to talk to people in the office. I know that sounds horrible but i've always been a lone ranger when it comes to work and working alone is the best thing in the world. I have alot of colleagues that i talk to over Skype which is fine so i'm not completely cut off..
Never having to ring in sick - It's rare i am sick enough to justify time off work. Since i broke my ankle 6 weeks ago, this has been the longest amount of time i have ever taken off. But there is nothing worse than ringing up your boss and telling them you aren't coming in because they always make you feel so damn guilty about it. Working from home means that even if i'm not feeling 100%, i don't have to get out of bed to go to work, i just stay in it and pull out my laptop! At least then i can carry on working while resting hehe. They understand family - What i have found with most of my jobs, is that they don't really give a damn if you have a family. There are certain companies in the world that ensure parents/carers are given statutory family time included in their contract but this isn't always the case. The company i work for are all about working around your family and understand how important it is to spend time with them. I choose my hours - Ok so i have to work my contracted hours which is 10-7:30 Mon-thurs and 9-3 Friday but when it comes to bank holidays, i don't have to work them if i don't want to. They will ask me if they need me but if i say no they aren't bothered. If i need to finish early one day, they don't have a problem! But are there any downsides to working from the comfort of your own home? For me, no. I have read alot of stories from people who have done this kind of thing before and they said 'you miss the interaction of other people to work with'. For them that's probably a major factor but for me i really couldn't care less. So in conclusion, i guess good things really do come to those who wait. I am finally in a job that works for me, i don't have to answer to anyone and i am in my favourite place with my favourite people. I can't really complain about that. Whether we like it or not, winter is well and truly on the way. The long evenings have given way to darkness, and the warm summer sun has once again gone, leaving us with cooler weather in its place. For many of us, the worst thing about winter is how cold it makes us. If, like me, the reason that you dread the winter is the cold weather, then you are in the right place. If you are lucky enough to have a fireplace in your home, light a fire. While radiators warm your home just as well as an actual fire, they don't give the same sense of warmth. There's nothing nicer than sitting by an open fire on a cold winter's day. Well, I don't think so, anyway. If you don't have a fireplace in your home, consider having one installed. Having a fire put into your living room won't come cheap. However, the warmth, and style that it will add to your living room, not to mention the value it will add, makes it worthwhile. Or, if you rent your home, you could always invest in an electric fire instead? I don't know about you, but on cold days there's nothing I would rather wear than a soft cosy, knitted jumper. The best thing about knitted clothing is that it's very in this season, so you can be cosy and comfortable, as well as stylish. Recently, I can across some Irish wool clothing and absolutely loved it. The designs were chic and stylish, and the wool was incredibly soft and cosy. You can buy some beautiful knitted pieces online, as well as on the high street, so make sure to have a browse. If you want to make sure that you stay as warm as possible this winter, keeping your feet warm and toasty is crucial. Believe it or not, if you're feet are cold, the rest of your body will feel cold as well. That's why keeping your toes nice and warm is so important. Personally, I like wearing slippers or thick socks throughout the colder months. The best socks to buy are the ones made of pure wool, as wool is one of the best insulators. Top tip: If you choose thick socks over slippers, try to choose a pair that have anti-slip soles, so that you don't slip while wearing them. Whether you are out and about or at home, one of the best ways to keep yourself warm is sipping on hot drinks. From hot chocolate and flavoured lattes to mulled ciders, there are so many delicious hot drinks to choose from. I don't know about you, but especially when I am out and about in the cold, there is nothing I enjoy more than a warm drink. Admittedly, despite the cold weather, one of the best things about winter for me is the delicious drinks that come with it. The coldness that comes with the winter months isn't very nice for anyone. But there are plenty of ways that you can ensure that wherever you are, you stay nice and warm. Getting invited to a wedding is lovely, but you need to make sure you thank the bride and groom by setting an example. How do you do that? Following appropriate wedding guest etiquette, of course! In my guide to wedding guest etiquette, you'll learn what to do and what not to do to have the best day. When you go to a wedding, you at least need to make sure you take a card to congratulate them and thank them for inviting you. If possible, give them a gift too. Pick something off their register, give them a voucher or money. Even the smallest amount adds up and will make sure they have a special start to married life! When you actually ask for a plus one, you essentially ask the bride and groom to pay for another guest. This just isn’t the done thing. Asking for a plus one is a huge no-no! Try to find somebody you know at the wedding to go with if you’re afraid of showing up alone. Even if you just show your face for a little while, there’s no harm in going alone. At a wedding you will ideally be on your best behaviour. This means you shouldn’t get too drunk! Drinking too much and making a fool out of yourself is one thing, but doing it at somebody’s wedding could have serious repercussions. Do you want to annoy the bride and groom? Have the guests talking about you? Keep yourself under control! One of the worst things you can do at a wedding is make it all about you. I know people who have got engaged at weddings, and it actually makes me feel infuriated for the new bride and groom. They did not spend thousands of pounds on their big day for you to go and make it your special occasion, or engagement party. Don’t try to mess with the wedding table plans either - they spent a long time on these. Again, control yourself and wait for a more appropriate time. Unless your white clothing has some kind of pattern on it, you should stay well away. Sometimes it’s best to stay away even if it does have a pattern on it. Stay away from white, cream, really light grey - anything that could be misconstrued as a bride colour. There are so many other colours you can go for, so pick something else. So, you RSVP’d and now you’re having second thoughts? I don’t care. You have to attend. They will have paid for a meal for you, a seat, and maybe even some drink. You might think nobody will notice if you don’t show, but it’s just plain rude. Only RSVP to your invitation if you really plan on going. All of the traditional wedding invitations will have multiple ways to contact the bride/groom, so you have no excuse. Make sure you have a great time! As a parent, I’m always looking for ways to entertain and amuse my child. Of course, days out are always great. But what do we parents do when those rainy days come? They can be a nightmare for keeping the kids entertained. Well, here are some of my craft ideas to help keep you and the kids busy on a wet weekend. A more unusual craft idea is one that I came up with this year. It’s making clocks out of old vinyl records. So, I got hold of an old record I no longer wanted. Then chose some funky looking card - try to pick something colourful with patterns. You’ll also need to buy the clock mechanism for the middle, but these aren’t expensive. Cut the card to fit the record. Then use craft guns to glue the card to the face of the record. Fit the clock mechanism and you’re done. You can do these in different sizes. And you can have all sorts of clock faces, from football teams to Marvel superheroes. Though, I’d recommend not letting the kids do this unsupervised. Let them help and take part, but make sure you’re there. You can get these packs with plain, blank models in them. Sometimes they’re made out of plastic, wood or rubber. They are shaped like creatures or objects, but they are blank. These are always a good choice because you can set the kids up with paint and let them be expressive. My tip here would be to make sure the area is well protected from the possibility of paint spillages! Try to get them sat at the table, and cover the furniture before they start. Seriously, you’ll thank me later! The classic craft idea is the old-school decorated picture frame. And this is a classic that still continues to endure to this day. Again, I like to go for cheap, plain frames that my daughter and I can go to town on. I would recommend decorating with items such as glitter, glued macaroni, and sea shells. Try to encourage something colourful and vibrant. Your child will no doubt want to use the picture frame, or give it to you as a gift. Another awesome craft idea I’ve discovered is to get the kids decorating lampshades. I never thought of this until I went to the Hull Summer Blog Meet earlier this year. I bumped into one of my friends there, and she mentioned this idea to me and I’ve been using it since. I normally go to the supermarket, or somewhere like B&Q and pick up cheap plain lampshades. That way the kids can go nuts with them, and it doesn’t matter. Of course, you may not want to put these freshly decorated lampshades in the living room. But, they might be a nice touch as a shade on your child's lamp. This gives them drive and impetus because they’re making something for their room. I love to get active with my and do some art and crafts when the weather is bad. Rainy days can be a nightmare for parents. It means the kids are cooped up inside all day, and they tend to get restless. This can lead to tantrums and chaos all around the home. So it’s important to come up with ways to keep them occupied. And crafts are an excellent way to achieve this, and they promote creativity too.